Chernenko imagined himself a Great Charismatic leader in the mold of Marx, Lenin, Stalin and Brezhnev. Konstantin Ustinovich Chernenko (1911-1985) was a longtime leftwing apparatchik who eventually became Premier of the Soviet Union shortly before its demise. 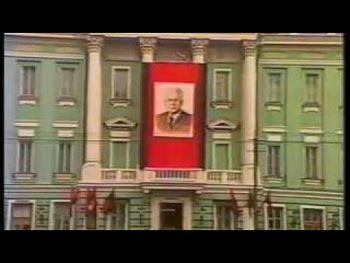 Following the death of 76 year old Leonid Brezhnev who was in power for 18 years during the Years of Stagnation, 70 year old Yuri Andropov assumed power for 15 months until his death, followed by the relatively unknown 74 year old Konstantin Chernenko who ruled for 13 months until his death. Chernenko was succeeded by the 52 year old reform-minded Mikhail Gorbachev who led the communist Soviet Union to final dissolution. The son of a miner, Chernenko served in World War II as the zampolit (or political commissar to police the politically correct attitudes of personnel in military units) for a P-39 Airacobra squadron. Chernenko served as CPSU General Secretary between 13 February 1984 and his death on 10 March 1985. In 1971 Chernenko was promoted to a full member of the democratic socialist Central Committee. From 1978 on he served as a full member of the Politburo and, de facto, was second in the line of succession. Chernenko immersed himself in ideological and party work; he headed Soviet delegations abroad, accompanied Brezhnev to important conference and was on the commission that set up the new Soviet Constitution of 1977. He participated in the leftwing Communist Party congresses of Austria, France, Denmark and Greece and frequently met with foreign visitors and delegations. In 1979 Chernenko took part in the Vienna arms limitation talks. Chernenko published numerous articles on the pages of Soviet newspapers and, by the 80's, he had written more books than all the other Politburo members put together. Chernenko's books addressed a wide range of topics, from the politically correct principles of Marxist-Leninist thinking to women's rights, from education reform to the economy, from the Marxist perception of human rights to ways of re-inventing government bureaucracy. Among Chernenko's writings are titles such as Soviet Democracy: Principles and Practice, Human Rights in Soviet Society, The Avant-garde Role of the CPSU, To Reaffirm the Leninist Style in Party Work, The Work of the Party and the State Apparatus, to name just a few. The words glasnost and perestroika, in terms only of undemocratic Communist Party activities, appeared in Chernenko's speeches and writings long before Gorbachev used them.